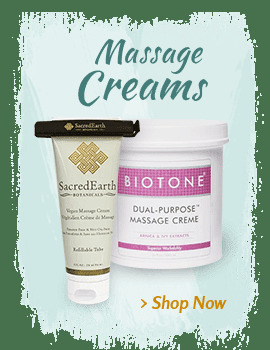 Home > Oils, Lotions & Creams > Sacred Earth Botanicals Oil, Lotion and Gel > Sacred Earth Botanicals - Organic Massage Cream - 8 oz. For a thrilling massage that is completely vegan, experience the soothing Sacred Earth Organic Botanicals Massage Cream from MassageTools. 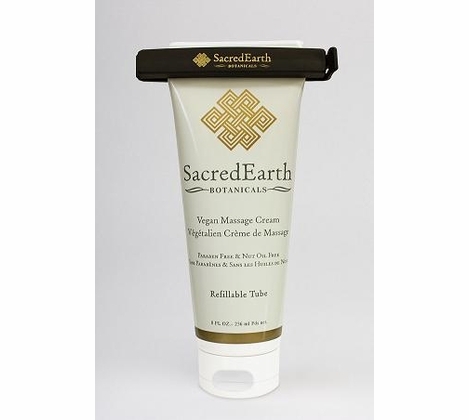 Sacred Earth's Massage Cream is completely vegan, made from a special blend of organic ingredients designed to nourish the skin while providing the massage therapist with excellent workability. The thick, rich formula is unscented and super concentrated, so you will need less massage lubricant to achieve your desired results. 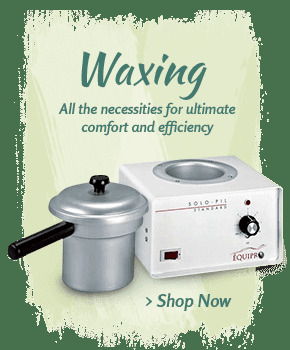 This special organic cream was formulated to provide great grip for controlled strokes and deep tissue work, yet it also has the smooth glide of a high-quality massage oil, making it an excellent choice for a full body massage. The organic massage cream is rich in essential fatty acids and also contains organic botanical extracts to help create a calming environment and a more therapeutic experience for the client. 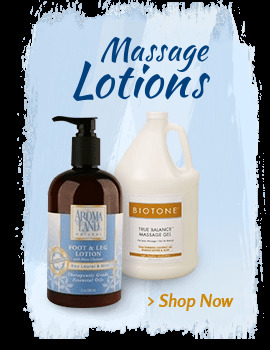 Many massage clients do not want to use massage lubricants containing animal products. Your vegan clients will love the smooth feel of the Sacred Earth Organic Botanicals Massage Cream as well as the fact that it is completely free of animal products. 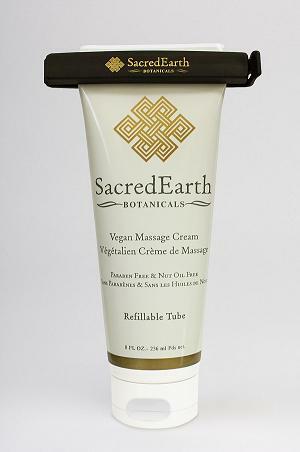 Vegan Massage Cream from Sacred Earth Botanicals is made of the highest quality ingredients available. 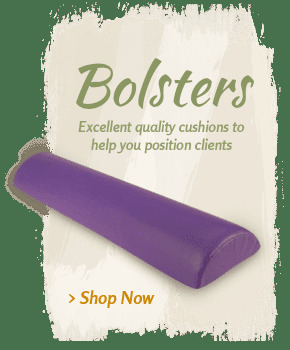 This luscious professional massage tool is also unscented, hypo-allergenic and made of all vegan ingredients. The combination makes it the ideal pick for vegan clients as well as people with sensitive skin and allergy issues. 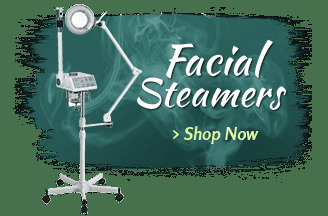 Scented creams trigger asthma and allergy issues for some clients, which is why having an unscented, hypoallergenic massage lubricant like Sacred Earth Organic Botanical Massage Cream is a must-have. This premium massage cream is designed to please even the most discriminating clients. The cream is sold in an 8-ounce squeeze tube and is easy to apply. 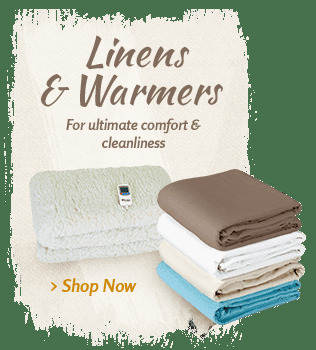 The paraben-free formula is the perfect choice for clients with sensitivities to heavy scents, animal products or certain types of additives. Vegan: vegan is a term to describe a lifestyle which discourages the use of products that are derived from or directly contain animal products. Emollient: lubricating agents that prevent water loss and softens skin. Humectant: a water-binding agent that helps the skin retain moisture. Antioxidant: counteracts the damaging effects of free radicals on the skin. Emulsifier: helps combine normally immiscible (unmixable) liquids like oil and water. 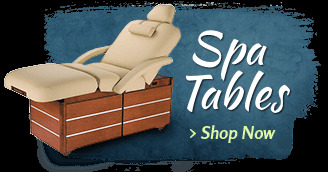 At MassageTools, massage professionals will discover an array of high-quality massage tools and equipment to help give their clients the relaxing and soothing massage treatment they seek. With options like the completely vegan Sacred Earth Botanicals Massage Cream, massage therapist can give clients the choices and options they want with their massage lubricants. 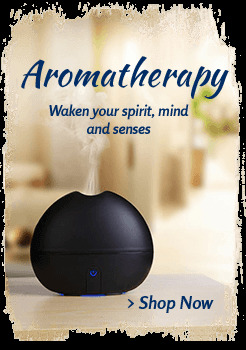 Love this item - just asked my spa to order it for our clients. Couldn't be happier. When you refill it, you have to cut the top open, fill it, fold it over and crimp it. 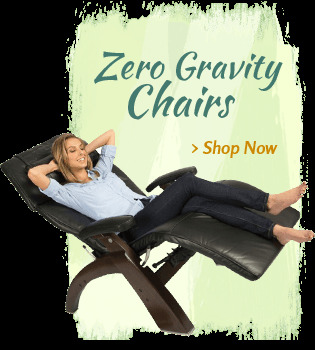 It seems like it doesn't hold very much by the time you do all of that. I will be constantly refilling it. A longer flap or a bigger tube would be great. But I do like this refillable tube better than the pump they had before. And it is a great cream. I use it for most clients. Ordered it so I could work on a very special friend who needed unscented lotion. I knew I was going to work on her on a bed so oil would be too messy. And this cream was just perfect. Just the right glide, really natural feel to it, totally unscented, easy to handle....perfect massage cream. Thanks!